Warning: these effects can be rather subtle. The phenomena on this page rely on your eye movements. You will be moving them anyway (you can never keep your eyes really still), but the demonstrations are aided by moving your display (if possible), or by scrolling the page in small steps. 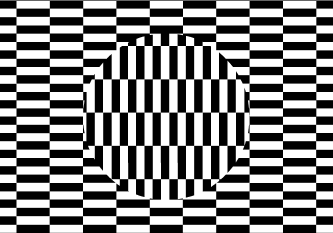 The first sample on the right is the “Ouchi Illusion” (Ouchi 1977, Spillmann et al 1986). 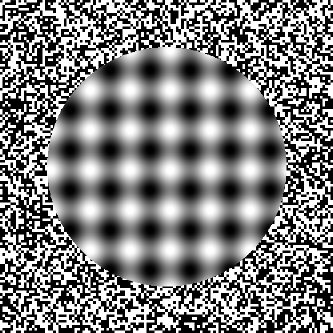 When you shake your head rapidly, or better shake the display, a central disk will segregate as a distinct object, which in addition seems to be floating atop the background. Should the above still images not have worked for you, this should do it. Ikuya Murakami further developed his demo of retinal image slip from 1998 to a effective version, depicted here on the left. (Linked with kind permission.) 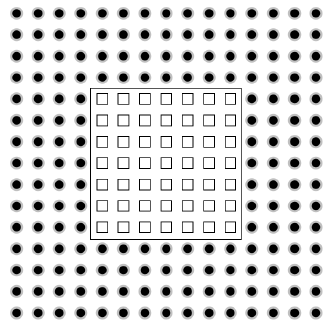 Even if you try to fixate steadily on the yellow target, you make residual eye movements, which are apparent in relative shifts of the central blurred shape relative to the surround. A deeper explanation is provided by Ikuya Murakami in the papers referenced below.